“For the most beautiful”. These are the words inscribed on a golden apple presented by Paris, Prince of Troy, to the goddess Aphrodite whom he has chosen over her rivals, Hera and Athena. In return, the goddess rewards Paris with Helen of Sparta, the most beautiful woman in the world – but unfortunately, Helen is already married. Not surprisingly, her husband, Menelaus, is enraged by the theft of his wife and sends the mighty armies of Greece, led by his brother King Agamemnon, to the shores of Troy to bring her back. 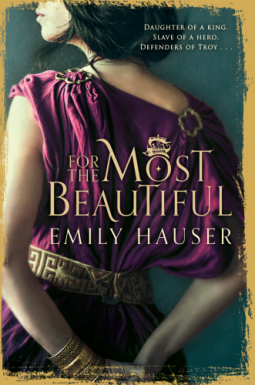 The story of the Trojan War is one that has been told many times before and with which a lot of readers will already be familiar before picking up Emily Hauser’s debut novel, For the Most Beautiful. However, this book retells the story from a feminine perspective and focuses on two female characters – Krisayis and Briseis – who both have important roles to play yet have not been given much attention in other versions such as Homer’s Iliad. Krisayis (whose name is usually spelled Chryseis) is the daughter of a Trojan priest and companion to Cassandra, a princess of Troy. As the novel begins, we learn that Krisayis is in love with Cassandra’s brother, Troilus, and that, much against her wishes, she is about to become a priestess devoted to the god Apulunas. Our other main character, Briseis, is a princess of Lyrnessus who has unexpectedly found love with her husband Mynes, despite growing up under the shadow of a prophecy which seemed to rule out the possibility of happiness. With the onset of war, the lives of both young women are thrown into turmoil; their paths cross while held captive in the Greek camp, but will they be able to change fate and save Troy? I found For the Most Beautiful a very enjoyable read. I think it was probably aimed at a younger audience but there was enough depth to keep an adult reader happy too. Having only read two or three other novels about Troy (including Madeline Miller’s The Song of Achilles and Judith Starkston’s Hand of Fire) I found that while I knew the basic outline of the story, a lot of it was new to me and the approach the author took made it feel fresh and original. It was interesting to see how Emily Hauser interpreted the characters of not just Krisayis and Briseis but also Achilles, Patroclus, Paris, Hector, Cassandra and others. The stories of our two heroines unfold in alternating chapters and I thought these sections of the book were well written and emotionally engaging (both Briseis and Krisayis suffer the death of a loved one and then face further ordeals and difficult decisions after their capture by the Greeks). However, these chapters are interspersed with short scenes in which we witness the gods on their mountain observing and manipulating the lives of the mortals below – and this is the one aspect of the book which really didn’t work for me. The writing style in these sections is quite different – the language feels much more modern and the tense changes from past to present – and the gods come across as bored, shallow and petulant. I think I can see what the author was trying to do here and I’m sure other readers will enjoy the light-hearted, comedy feel of these scenes, but it just made me impatient to get back to Briseis and Krisayis! After finishing this book, I was pleased to discover that it’s the start of a new Golden Apple trilogy. Greek mythology is not a subject that particularly interests me, but I was still captivated by For the Most Beautiful and am looking forward to reading another two books by Emily Hauser. Yes, I enjoyed seeing the story told from a female perspective, especially as it’s usually so male-dominated. Like Anbolyn I have been wondering about Miller. I must check if there is anything listed in the forthcoming books. I have always felt that there was false logic going on in respect of the Trojan War. Surely Menaleus should have been aggrieved at Aphrodite not Paris, who presumably hasn’t got much choice about taking on Helen. I suppose you don’t set out to take revenge on a goddess though, not if you want to survive to tell the tale. I can’t find any information on a new book by Madeline Miller, so please let me know if you do come across anything. This is going on my list! I have also read The Song of Achilles. I have read The Firebrand by Marion Zimmer Bradley (pub date, 1987), excellent on the women’s viewpoint. The Illiad is so male-centric that we need these books! I will check out Hand of Fire. I haven’t read The Firebrand – I’ll have to investigate. Thank you for your wonderful review about this modern adaption of the Iliad by Homer. Actually the fickleness of the gods is quite normal in Homer and (this fickleness) is supposed to represent how humans would act if we were given immortality. But because we have mortality, we possess things like courage, daring, excellence (Arete), etc. In the Odyssey, Odysseus is given the opportunity to become immortal by the goddess Calypso (her name means to hide/covet). He refuses because he knows the tremendous costs that are associated with it. He would rather go home to his family and his wife, Penelope, than to become immortal. Not all the gods in Ancient Greek mythology (Religion) are fickle however. Some are wise, help others, and advise on matters. Others show many human qualities, as OVID eventually writes about in his Metamorphoses. There is a course about Greek Myth from the Teaching Company, teach12.com, or the Great Courses.com. I would recommend listening to it to get a better perspective on Homer and the treatment of the gods in Epic. They also have a course by the same author on the Iliad and one on the Odyssey. I would recommend all of them. Get them while on sale, not full price. Thank you – I’ll have a look at those courses. I’m aware that the gods are often depicted as fickle, but the way they are portrayed as speaking and behaving in this particular novel makes them seem more like modern day teenagers, which didn’t really match the tone of the rest of the book. I was tempted by this when I spotted it on Netgalley too. I am pleased to hear you enjoyed it. I will keep it in mind. Hopefully you will get another opportunity to read it!